I love geeking out when it comes to Mac apps and optimising how I use my computer. Earlier this year I started listening to the Mac Power Users podcast and this has only fuelled my obsession further. 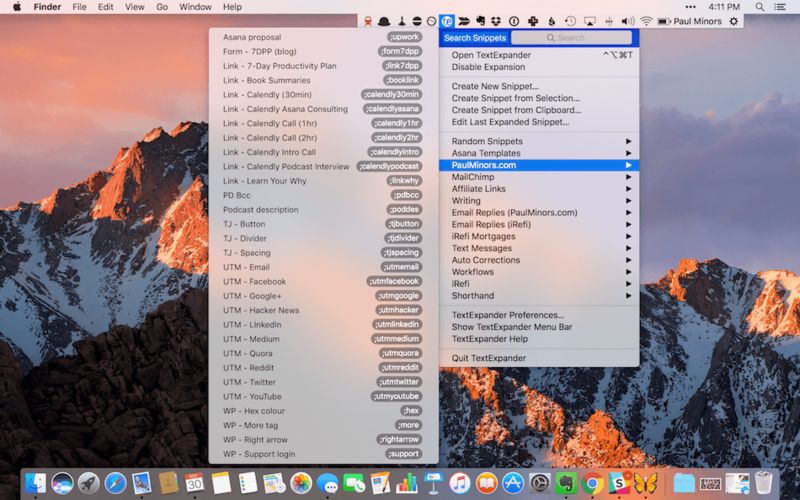 Today I wanted to share some of the menu bar apps that I'm using to be more productive and get more out of my Mac. First off, all my menu bar apps/icons are organised and hidden from view in the Bartender bar. This nifty little app is really useful for cleaning up your menu bar when (like me) you have a lot of icons and apps floating around up there. It doesn't do much apart from organising the bar a little more, but it's useful for keeping your menu bar nice and minimal. You can customise which menu bar items, including the default Apple icons, appear on the main menu bar or in the Bartender bar. You can even set icons to temporarily appear on the main bar when that particular app becomes active. I've also programmed the bar to open when I use a particular shortcut (Option + Cmd + b). This means I can access my menu bar apps without taking my hands off the keyboard. 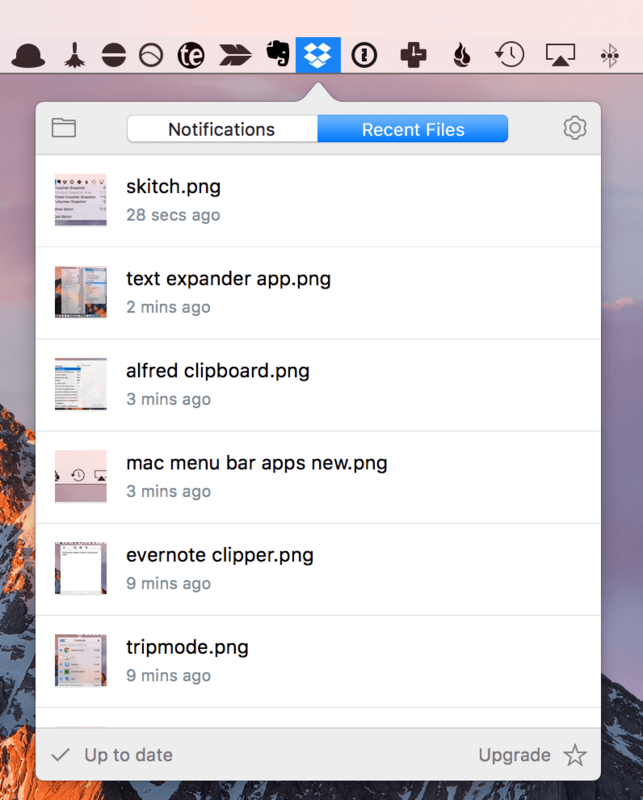 TripMode is a great little app for Mac users on the go. 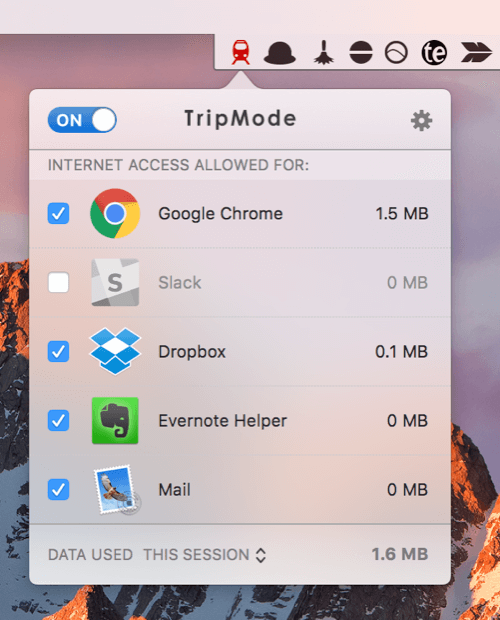 TripMode restricts which apps can access the internet when you're using Personal Hotspot on your phone. This means when I'm out and access the internet via my cellular connection, apps like iCloud, Dropbox, Backblaze and Evernote can't access the internet unless I let them. This is a great data saver as I'm not wasting precious hotspot data on Dropbox syncing or Backblaze backups. If you rely on Hotspot a lot and you have a small data allowance then TripMode is a must. Alfred is like Spotlight search but on steroids. The cool thing about Alfred is the I don’t really use the menu bar icon much as I access Alfred using the Option + space shortcut. The cool thing about Alfred are the workflows and custom searches you can set up when you purchase the Powerpack. For example, I have a search set up so that when I type the word “payment” and then an email address, I can search for customer payments on my WordPress back end. By far the best feature of Alfred is the clipboard. When I use the shortcut Ctrl + space I can bring up a list of my most recently copied text and links. This speeds up my work on the Mac like you wouldn’t believe. I've been working next to people before when I've quickly copied and pasted multiple snippets of text and it never ceases to amaze people how cool this is. When you first start using this feature, it takes a little getting used to. But it's worth developing the habit and you'll be amazed at how much quicker you can work once you start copying and pasting multiple snippets. Hazel has saved me a tonne of time when it comes to naming and organising invoices and receipts that I get on a regular basis. 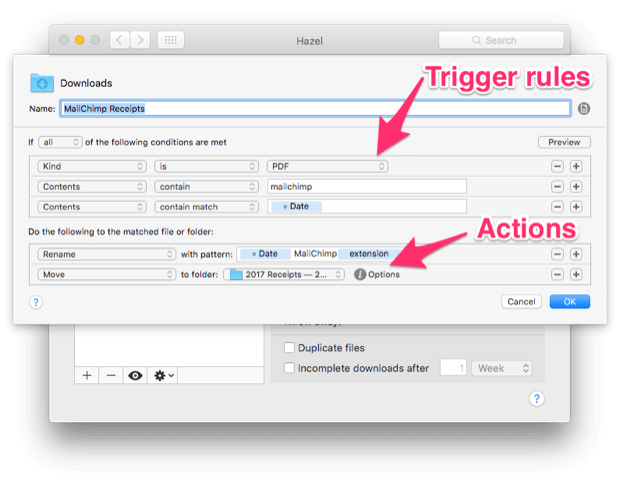 The menu bar app is useful for starting and stopping Hazel or for quickly having Hazel check a folder for new items to automate. For more information on Hazel, read my getting started guide. Amphetamine is a useful little app for keeping your Mac awake or preventing your screensaver from kicking in. It's nice and lightweight and easy to use. 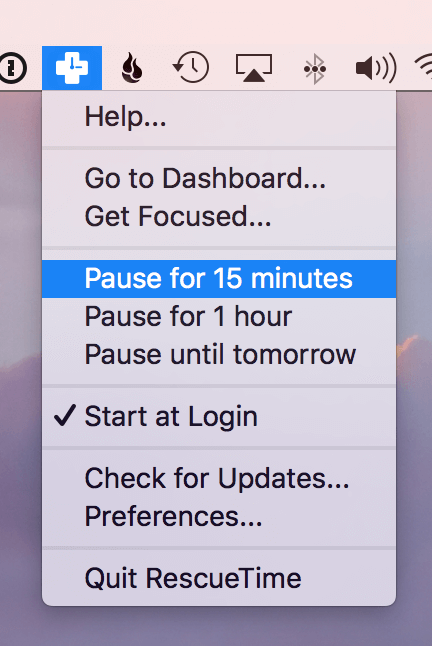 When you click the icon, it'll keep your Mac awake for the default length of time (customisable), or you can right click to set a custom time or keep your Mac awake indefinitely. I like how you can customise the icon; you can choose between a little amphetamine pill or a molecule icon. The timer which displays while the app is running is also super handy. f.lux is probably one of those apps you've heard talked about all over the place. 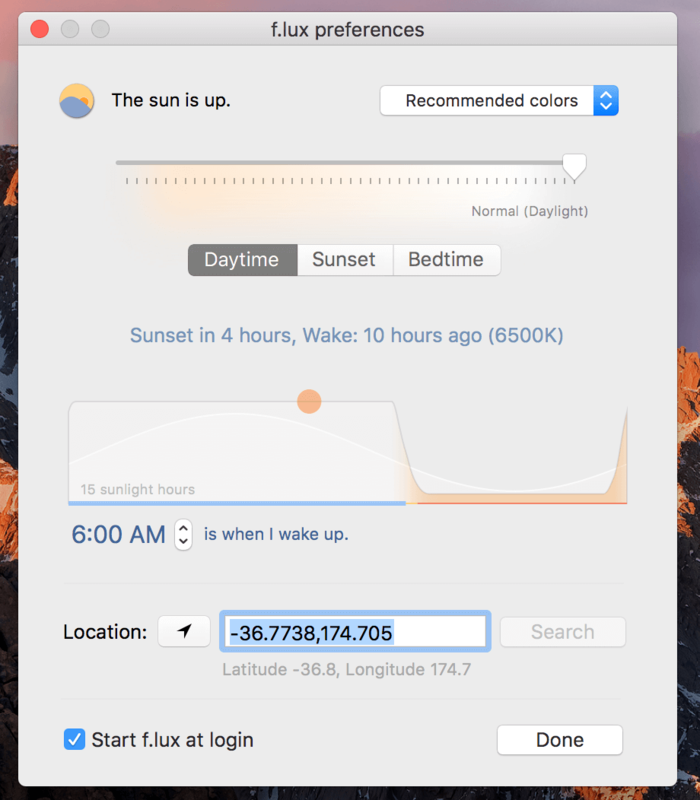 If you haven't, f.lux runs in the background and adjusts the colour of your display as the sun goes down based on your location. The app reduces the amount of harsh blue light that gets emitted from the display (making it quite orange) helping you to get a better nights sleep. Along with Alfred's clipboard, TextExpander is one of my secret weapons when it comes to using my Mac faster. With TextExpander, you can store big blocks of text which you can quickly expand using a simple abbreviation or keyboard shortcut. This is incredibly useful for storing canned email responses, commonly used links, personal details like phone numbers and addresses and other text you have to type on a regular basis. 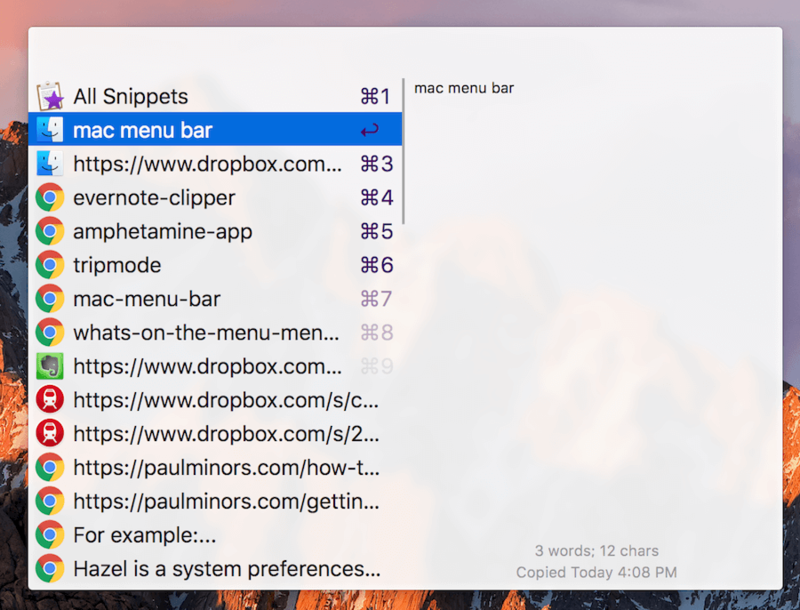 The menu bar icon is where you can quickly access and search for your snippets. The nice thing about TextExpander is the extra fill-ins and options you have when creating your snippets. For example, in an email snippet, I can have a text field to type in the recipient's name and I can set up drop-down boxes, optional paragraphs and open text fields for customising my messages. You can even replicate keystrokes like the tab key. So I can type my abbreviation in the subject line, the snippet expands to fill the subject and tabs to then fill out the body of the email. I even use TextExpander for storing lists of subtasks that I often use when creating Asana tasks. When you start using TextExpander and get comfortable with the different options, you’ll find use cases for it all over the place. Trust me when I say that this app can save you a lot of time. Skitch is screen grab and annotation app by Evernote. Usually, when I need to take a screenshot, I use the builtin Mac shortcut, Cmd + Shift + 4. 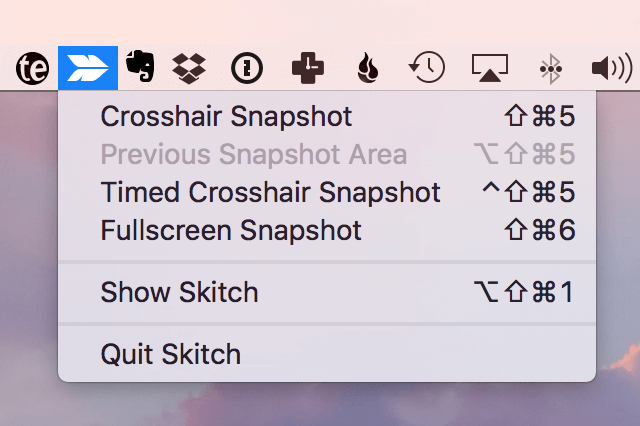 However, when I want to take a screenshot which I’m then going to markup and annotate, I’ll use the Skitch menu bar app or the shortcut Cmd + Shift + 5. The Skitch app lets you annotate images with text, lines, arrows and other tools. You can even use Skitch to blur out sensitive information contained in the image. Once I’m finished with my image, I can then save this straight to my Evernote account if I need to. Evernote, everyone’s favourite note taking app is great for storing notes, ideas, reference material, articles and documents (for more info, read my getting started guide). 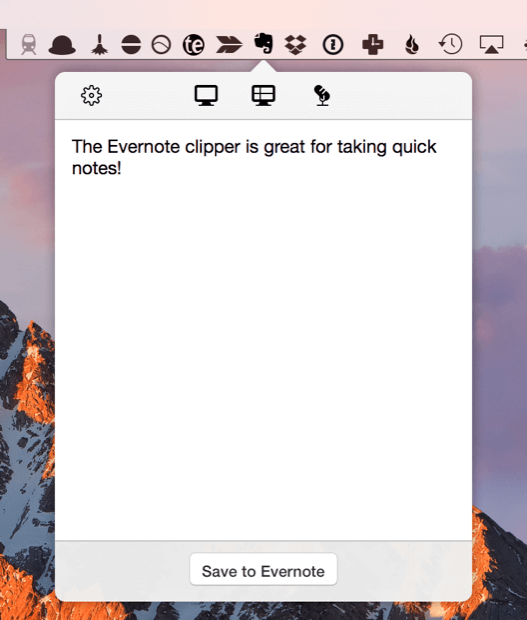 I use the menu bar note clipper (Cmd + ctrl + n) to quickly write notes and jot down key information (great for when I’m on the phone). Often I don’t even save these notes to Evernote, but this little menu bar clipper is great for using as a scratchpad. A lot of people have a notebook next to them as they work (in fact, I have one next to me right now). The Evernote clipper is sort of like the digital equivalent of this. I use it dozens of time each day and is probably my favourite feature of Evernote. Dropbox is my go-to online storage solution and needs no explanation. To be honest, I don't use the menu bar app much, but it's handy to look at every now and then to check the sync status of my files. 1Password is where I store all my passwords, credit card information, personal info, passport details and other sensitive information. 1Password takes the hassle out of creating long and unique passwords for your different accounts, dramatically improving your online security. 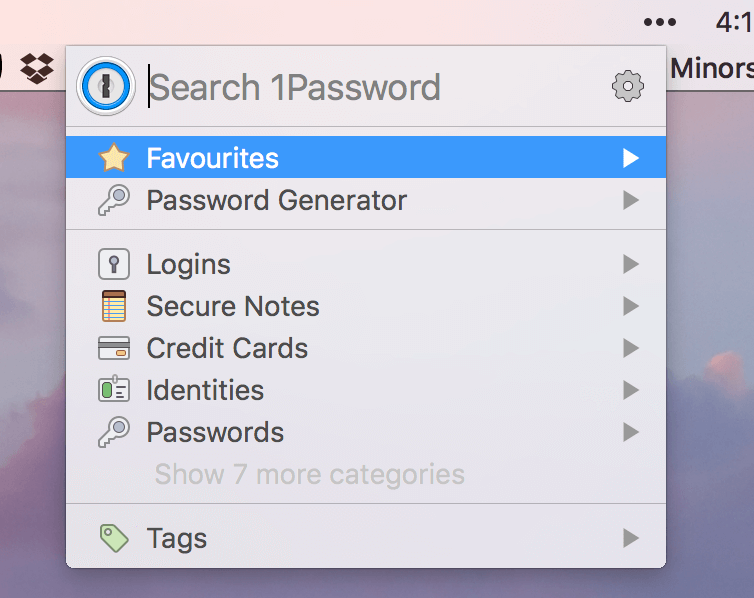 With the 1Password mini app, which is accessible from the menu or with the shortcut, Cmd + option + , you can quickly access all your passwords. The mini app even recognises which site you're on and suggests the right password for you. When you’re setting up an account for the first time, you can generate a new, unique and strong password and instantly store this in your 1Password account. And because 1Password can be synced with Dropbox or iCloud, all your passwords are accessible on the go as well. If you have a couple of passwords you use for all your different accounts, you’re asking for trouble… Do yourself a favour and pay the $2.99/month for 1Password. You won’t regret it. RescueTime is a really handy app for tracking time spent on specific websites and using particular apps. The RescueTime app runs in the background and monitors your behaviour. On the RescueTime website, you can then view reports of how you’ve spent your time. Apps like Facebook and Twitter can be classified as “unproductive” while tools like Evernote or Google Drive can be labelled “productive”. What gets measured gets managed. By measuring how you spend your computer time, you can become more mindful and form better computer habits. The menu bar app is useful for pausing the tracking for a period of time. You can also use it to quickly access your RescueTime dashboard and viewing stats. When I discovered Backblaze, I couldn’t help but think – “This is just what I need”. Before Backblaze, I backed up my computer primarily using an external hard drive and Apple’s Time Machine app. Now, Backblaze handles all backups for me and keeps an entire clone of my hard drive stored on the cloud (which in my opinion, is even better than storing a physical backup in my house). Further to this, I have an encryption key set up and stored in 1Password, so this backup is encrypted as well. 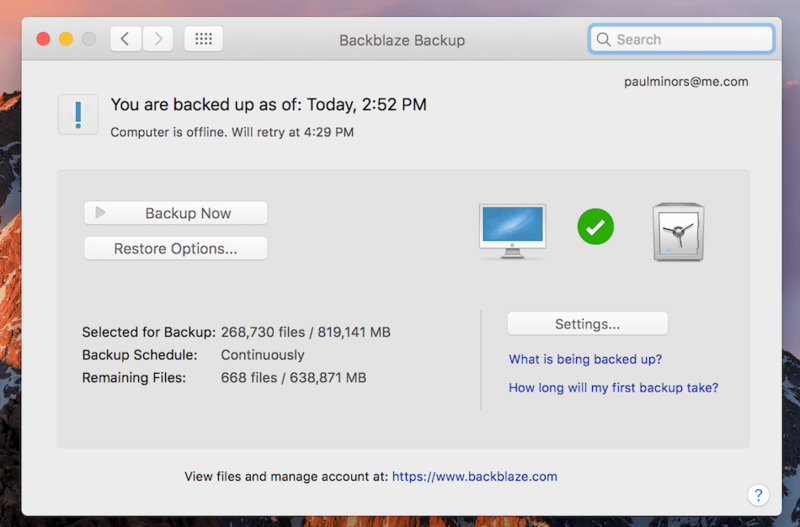 Backblaze takes all the hassle out of backing up your computer. The initial backup takes a few days and after that, any incremental changes to files get synced to the cloud via your wifi connection. For $5/month, the convenience and piece of mind I get from using Backblaze is a bargain. Finally, we come to FruitJuice. This handy little app monitors how much time you spend on battery vs. AC power. 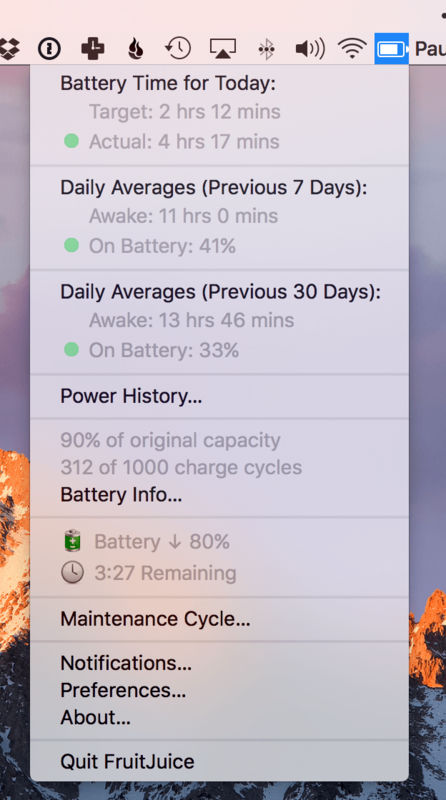 It’s not good to be connected to power the whole time and going through regular charge and discharge cycles is good for the batteries health. FruitJuice reminds you to unplug if you’ve been connected to power for too long. It’ll then prompt you when you’ve met your target daily average battery time so you can plug back in again. Do you have any recommended menu bar apps I haven’t mentioned? Let me know in the comments below!